Rabbit polyclonal beta Tubulin antibody. Validated in WB, IP, ELISA, IHC, ICC, ICC/IF and tested in Mouse, Rat, Chicken, Human, Pig, Xenopus laevis, Zebrafish, Chinese hamster. 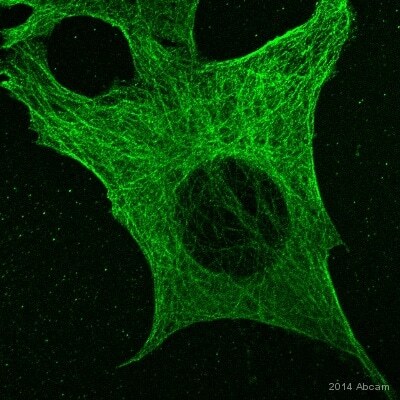 This antibody detects a single clean band at 50kD representing beta Tubulin. This band is significantly reduced by using peptide blocking. Synthetic peptide conjugated to KLH derived from within residues 1 - 100 of Human beta Tubulin. Our Abpromise guarantee covers the use of ab6046 in the following tested applications. WB 1/500. Detects a band of approximately 50 kDa (predicted molecular weight: 50 kDa). Ubiquitously expressed with highest levels in spleen, thymus and immature brain. Some glutamate residues at the C-terminus are polyglutamylated, resulting in polyglutamate chains on the gamma-carboxyl group (PubMed:26875866). Polyglutamylation plays a key role in microtubule severing by spastin (SPAST). SPAST preferentially recognizes and acts on microtubules decorated with short polyglutamate tails: severing activity by SPAST increases as the number of glutamates per tubulin rises from one to eight, but decreases beyond this glutamylation threshold (PubMed:26875866). Some glutamate residues at the C-terminus are monoglycylated but not polyglycylated due to the absence of functional TTLL10 in human. Monoglycylation is mainly limited to tubulin incorporated into axonemes (cilia and flagella). Both polyglutamylation and monoglycylation can coexist on the same protein on adjacent residues, and lowering glycylation levels increases polyglutamylation, and reciprocally. The precise function of monoglycylation is still unclear. Phosphorylated on Ser-172 by CDK1 during the cell cycle, from metaphase to telophase, but not in interphase. This phosphorylation inhibits tubulin incorporation into microtubules. ICC/IF image of ab6046 stained HeLa cells. The cells were 4% formaldehyde fixed (10 min), permeabilized with 0.1% Triton X-100 for 5 minutes and then incubated in 1% BSA / 10% normal goat serum / 0.3M glycine in 0.1% PBS-Tween for 1h to block non-specific protein-protein interactions. The cells were then incubated with the antibody (ab6046, 1µg/ml) overnight at +4°C. The secondary antibody (green) was ab150081 Alexa Fluor® 488 goat anti-rabbit IgG (H+L) used at a 1/1000 dilution for 1h. DAPI was used to stain the cell nuclei (blue) at a concentration of 1.43µM. This product also gave a positive signal under the same testing conditions in HeLa cells fixed with 100% methanol (5 min). Immunohistochemistry (Frozen sections) - Anti-beta Tubulin antibody - Loading Control (ab6046)Image courtesy of an anonymous Abreview. ab6046 staining beta Tubulin in human stomach tissue by Immunohistochemistry (frozen sections). Tissue was fixed with acetone and then blocked with 5% serum for 1 hour at 23°C followed by incubation with the primary antibody at a 1/200 dilution for 1 hour at 23°C. An undiluted HRP-conjugated goat polyclonal was used as secondary antibody. ICC/IF image of ab6046 stained HeLa cells. The cells were 4% PFA fixed (10 min) and then incubated in 1%BSA / 10% normal goat serum / 0.3M glycine in 0.1% PBS-Tween for 1h to permeabilise the cells and block non-specific protein-protein interactions. The cells were then incubated with the antibody (ab6046, 5µg/ml) overnight at +4°C. The secondary antibody (green) was DyLight® 488 goat anti-rabbit IgG - H&L, pre-adsorbed (ab96899) used at a 1/250 dilution for 1h. Alexa Fluor® 594 WGA was used to label plasma membranes (red) at a 1/200 dilution for 1h. DAPI was used to stain the cell nuclei (blue) at a concentration of 1.43µM. Adiponectin (green) was detected using adiponectin primary antibody (ab22554; 2.5 µl/mL). Beta tubulin (red) was detected using the rabbit polyclonal (ab6046) antibody. 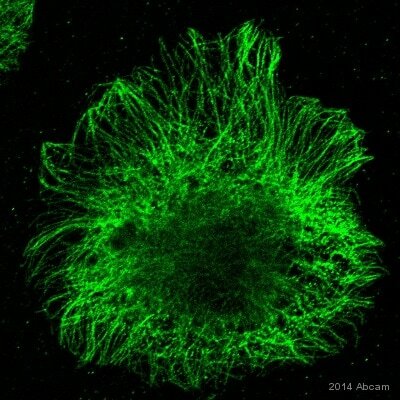 Cells were imaged by confocal microscopy, using z-stack for adipocyte-like cells. Beta Tubulin was immunoprecipitated using 0.5mg Hela whole cell extract, 5µg of Rabbit polyclonal to Tubulin and 50µl of protein G magnetic beads (+). No antibody was added to the control (-). Proteins were eluted by addition of 40µl SDS loading buffer and incubated for 10min at 70oC; 10µl of each sample was separated on a SDS PAGE gel, transferred to a nitrocellulose membrane, blocked with 5% BSA and probed with ab6046. The cells were 100% methanol fixed (5 min) and then incubated in 1%BSA / 10% normal goat serum / 0.3M glycine in 0.1% PBS-Tween for 1h to permeabilise the cells and block non-specific protein-protein interactions. The cells were then incubated with the antibody (ab6046, 1µg/ml and ab37266, 1µg/ml) overnight at +4°C. The secondary antibodies were ab150115 Alexa Fluor® 647 goat anti-mouse IgG (H+L) used at 2µg/ml for 1h and ab175652 Alexa Fluor® 405 goat anti-rabbit IgG (H+L) used at 2µg/ml for 1h. Nuclear Green LCS1 (ab138904) was used to stain the cell nuclei (green) at a dilution of 1/500. 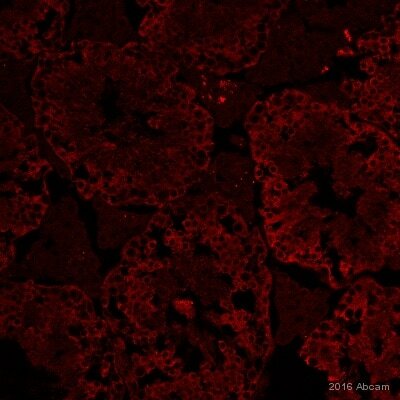 IHC image of beta Tubulin staining in human liver carcinoma FFPE section, performed on a Leica BondTM system using the standard protocol F. The section was pre-treated using heat mediated antigen retrieval with sodium citrate buffer (pH6, epitope retrieval solution 1) for 20 mins. The section was then incubated with ab6046, 5µg/ml, for 15 mins at room temperature and detected using an HRP conjugated compact polymer system. DAB was used as the chromogen. The section was then counterstained with haematoxylin and mounted with DPX. Publishing research using ab6046? Please let us know so that we can cite the reference in this datasheet.